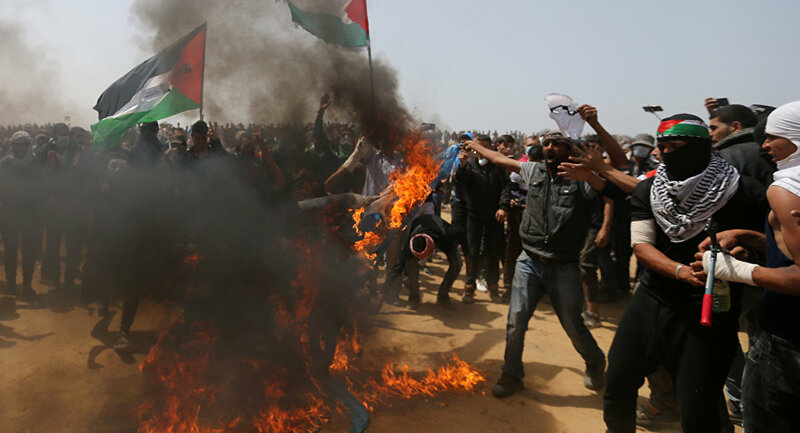 Four Palestinians have been killed and over 640 wounded by the Israeli Forces in fresh unrest on the Gaza border area on Friday, as six-week-long protests had entered their fourth round. The protests have been lodged every Friday for the past four weeks, as Palestinians demand their right to return to their ancestorial territories which are now Israel. They are expected to culminate on Nakba day, May 15, the date which marks the so-called "catastrophe" when millions of Palestinian marchers had to flee their homes after the creation of the state of Israel. Some Palestinians brought wire-cutters in order to cut through the security fence. Israeli servicemen, trying to prevent violent clashes, have been warning the demonstrators over loudspeakers not to approach the border fence. According to the Israeli Defense Forces (IDF), a Molotov cocktail attached to a kite was sent over the Gaza border into Israel's territory.